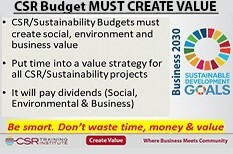 Business decisions, including CSR and sustainability budgets, should be based on business value. Of course, you should integrate and align social value and environmental value, but never leave out business value. This will lead to better and more sustainable social and environmental impact, as well as business impact. Smarter decisions and more impact. Who can argue with that? And, it will create a strong internal stakeholder network, as opposed to charity only projects, which are seen to take hard earned resources from the company with little return. A simple value-optimization analysis, done at the front end and regularly throughout the life of CSR and sustainability projects can extend and expand impact and value for all..
Too often the social responsibility decisions and actions of business are done without any sort of value analysis. Literally, there is no thinking or work at all on how to optimize value for the business.. It always amazes me, the same people who systematically apply value-focused rigour and optimization analysis to capital and operating decisions will approve major CSR/sustainability budgets with little consideration of how they can create the most value for their organization..
Often there is some analysis done on the social/environmental impact and value, but little on the business value, as if it was unimportant – or would simply happen anyway (It won’t). Why, when you are spending the money anyway, wouldn’t you look at how to create and capture the most value from it? Optimizing value back to the business from CSR and sustainability spending doesn’t take away from the social/environmental value and impact. In fact, it can create more because when you create and capture business value it makes future projects easier to sell and encourage other businesses to make similar investments. 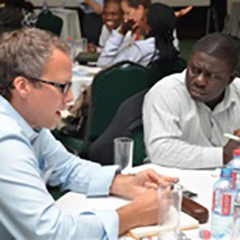 Often communication can be an easy way to unlock incremental value and impact from sustainability investments. Effective communications involves a lot more than simply bragging about what an organization is doing. It should serve a strategic purpose, sharing information in ways that enhance impact at all levels. For example, a couple months ago I noticed a newspaper article about a large Canadian mining company that had invested millions of dollars in a livelihoods, water management and community development project in rural Africa; in communities near its minesite, and in communities further away. They had also invested many millions in developing a solar power facility that had significant environmental and business impact. Despite having invested in a big public announcement and having a promotional type blast on their website, they didn’t take the steps to connect these investments to broader objectives that were priorities of some of their key stakeholders to show how the company was making a meaningful contribution AND adding business value. Yet, despite the fact that the millions they had invested in these CSR/sustainability projects made significant contributions to a number of the SDGS, they never made the explicit connection. Their stakeholders would have to do their own analysis and work, just to see how the company was contributing to their priorities. Had this company done a simple value-optimization analysis they would have discovered easy ways to extend the value and impact of the millions of company dollars they were investing; creating more value for society, environment and shareholders. They aren’t alone. For some reason executives don’t feel a need to be efficient at creating and capturing value from CSR and sustainability spending. Our internal programs are designed to show leadership and staff how to identify key metrics and properly gather and manage data to showcase impact AND value. By showing organizations how to properly measure the impact and results of CSR projects makes it easier to demonstrate to stakeholders and shareholders that these programs are actually legitimate business drivers. Contact us today and let’s see discuss how you can better measure the impact and results of CSR and find out how it fits into your corporate strategy for growth.